A beautiful modern 18kt yellow and white gold pendant that features 15 round brilliant cut diamonds, est. 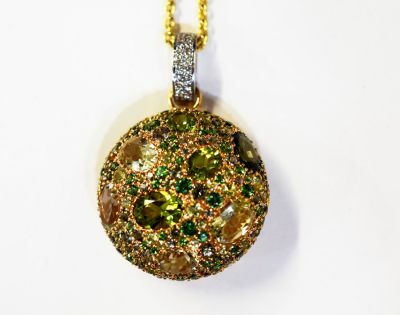 0.18ct (clarity:VS-SI & G-H colour); 8 oval mixed cut light-to-dark yellowish green peridots, est. 6.10ct and 184 round mixed cut light-to-medium yellowish green and white tourmalines, est. 3.10ct. The chain is approx. 16 inches (40.64cm) in length.